View of the Old Well and Pump Room in Cheltenham Spa in Gloucestershire. In the early 18th century, salt water springs had accidentally been discovered at Cheltenham and the spring was developed into a well by the owner Henry Skillicorne. Bathing in salt water was recommended as a new cure for ill health by Georgian physicians. John Byng, Viscount Torrington, who toured here in 1781, commented 'the waters are in high vogue, and the last season the best ever known (the opinion being that the sea coasts are dangerous in war-time)'. However it was the visit of George III and his family in 1788 that really made Cheltenham fashionable. This print shows the 'Original Chalybeate Mineral Aperient Spa' of the High Street which was built in c.1802-3. 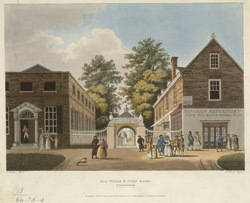 It supplemented the original Skillicorne's Well, which was renamed Royal Well after 1788. At the entrance to the Spa, is Fasana's Repository from No. 35 Milsom Street, Bath.